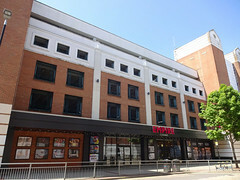 It closed for a complete redevelopment in June 2017, but reopened in February 2018 (see Croydon Advertiser article). Screens have normal seats, sofas and recliners. Accessibility info: Stairs and lift to get where the screens and toilets are. All level or ramped once there to get to screens and toilets. Screens have stairs to the banked seating but do have wheelchair places at the front. Last edited 2018-08-06 22:33:06 (version 8; diff). List all versions. Page last edited 2018-08-06 22:33:06 (version 8).